There's ANOTHER course at the Bay Point Marriott Resort? You betcha! 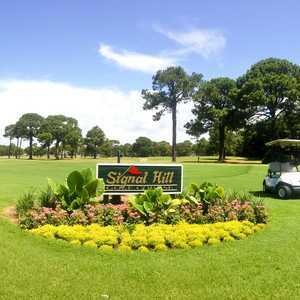 PANAMA CITY BEACH, Fla. — There are actually two golf courses at the Bay Point Marriott Resort, though you might get the impression there's only one. The Meadows course opened in the 1970s, from a design by Willard Byrd. 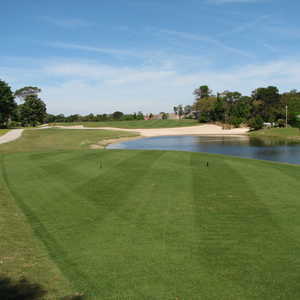 Bay Point Resort offers two championship layouts, the Meadows Course and the Nicklaus Course, which is northwest Florida's only course designed by Jack Nicklaus. The resort is nestled within an expansive wildlife sanctuary, just minutes from the pristine white sand beaches of Panama City. The Meadows course is about as overshadowed as you can get by the resort's other course: the Nicklaus course, which is famous for two reasons. One, it used to be known as the most difficult course on the planet, with a slope rating of — hold on! — 157. It was known then as Lagoons Legend. Two, it was completely renovated about two years ago by Jack Nicklaus' design team, chiefly by Gary Nicklaus, and so carries the distinction of being the only Nicklaus-designed course in this part of the state. The resort plays up that connection big. As far as the Meadows architect, no one seemed to know at first. We had to launch a search party and finally came up with ... Willard Byrd. Now, Byrd is no small name to those who play a lot of golf, particularly in the Southeast and in the Carolinas, but he's no Jack Nicklaus. The Meadows course wears its red-headed step-child status well, though; it doesn't try to hog the spotlight. It isn't a big and bold statement like the Nicklaus course. Rather, it's a very pleasant, old-time country golf club course that trickles through an equally pleasant, old-time neighborhood. It could be called "That '70s course," since it was built in the 1970s and embodies many of the architectural characteristics of that era. The Meadows has tree-lined fairways, many of them fairly narrow, and many of them doglegs. Some of the doglegs are risk-reward, offering the option of dramatically shortening the route to the green — at your peril if you miss. To do so, you'll almost certainly be trying to carry tall trees, or in some cases, large, fairway bunkers. Others are angled so that the dogleg cannot be compromised except by the longest Alpha hitters, and you're playing for the best route into the green. In fact, quite a few holes are like that: They can be played several different ways, which is always a treat for the thinking golfer. They did that back in the '70s, think. All this being said, don't play the Meadows expecting to be severely tested, unless it's your driver's accuracy you want to gauge. "This is an old-style country club course that's not too terribly challenging if you can keep it in play," Head Professsional Russ Montgomery. "The trees are what give it character. You get up in there and you can shoot some high numbers." True, though you will usually have a chance at a recovery shot since the rough isn't overly penal. But, any shot offline and into the trees and you can generally count on a bogey. The terrain is dotted throughout by lakes and ponds, much of it lateral, though a few short water-carries do exist. There is some pesky bunkering, usually challenging you at the doglegs, but most of the bunkers are flat and friendly. The greens suit the rest of the golf course: They are relatively flat, though a handful have some subtle, hard-to-read breaks. Green fees at the Meadows course are in the $60-$80 range, which is about $20 cheaper than the Nicklaus course. The Meadows is a very pleasant day on the links and the course, played in mid-April, was in good condition. It can be a nice challenge from the back tees at 6,913 yards. Playing from the whites would probably make it too easy, even for the mid-handicapper. The course is slated for a renovation soon, probably in about a year or so. There are also plans to build a new clubhouse. Both resort courses are managed by Honours Golf in Birmingham, so service is excellent and the practice facility is top-notch. That's a big plus for resort guests who want to put in range time. The Bay Point Marriott Resort is an oasis in what can be a very busy beach scene in Panama City Beach. It's situated on a 1,100-acre wildlife sanctuary and overlooks St. Andrews Bay — not quite the Gulf of Mexico, but a beautiful view nonetheless, with the added bonus that the bay doesn't attract the hordes of spring breakers that drove me nuts on another un-named Gulf-front Panama City Beach resort. The Marriott has been recently renovated — they were still putting on the finishing touches during my visit — and features 356 guest rooms, including 78 golf villas. The facility has 40,000 square feet of meeting space, four restaurants, a newly renovated spa and fitness center, one indoor and three outdoor pools. There is a private bay/beach area for those looking for privacy. For the active-minded, there are seaplane rides, beach volleyball, kayaks and jet skis, as well as a host of other water sports.